Backpacking to Amethyst Lake in the High Uinta Wilderness is a backpackers dream - a high alpine lake, lots of hiking and fishing, great campsites, not too many people, and cooler temperatures. Although the hike in is somewhat tough (especially if you are carrying a 30-40 lb pack), the reward and view is well worth the hard effort. 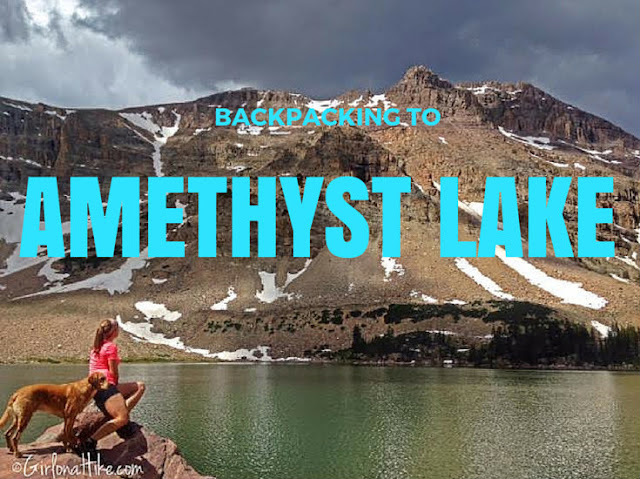 Amethyst Lake is located in the Christmas Meadows are of the Uintas, with a wide open meadow strewn with trees, resembling, well, Christmas trees. 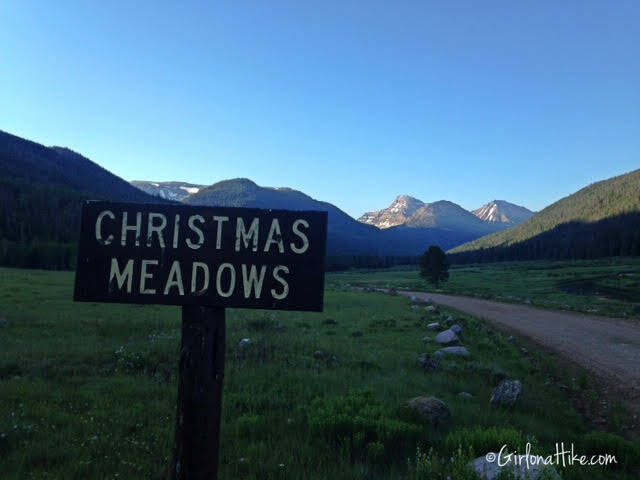 Christmas Meadows is situated perfectly to view Ostler Peak, Hayden Peak, and among the Stillwater Fork of the Bear River. 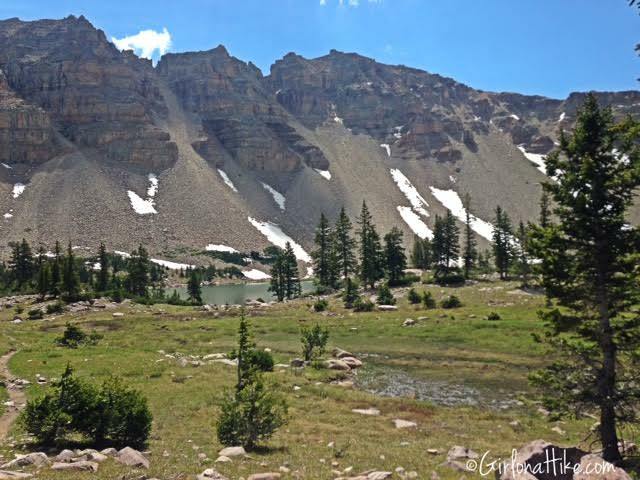 Amethyst Lake is one of several lakes that is accessed via Christmas Meadows. 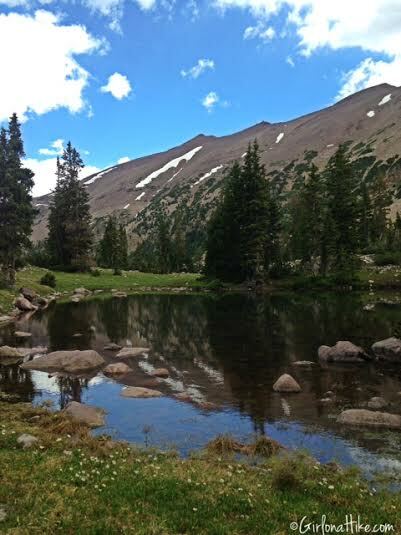 Ryder Lake, Ostler Lake, Kermsuh Lake, and several unnamed lakes are popular lakes for hikers as well. 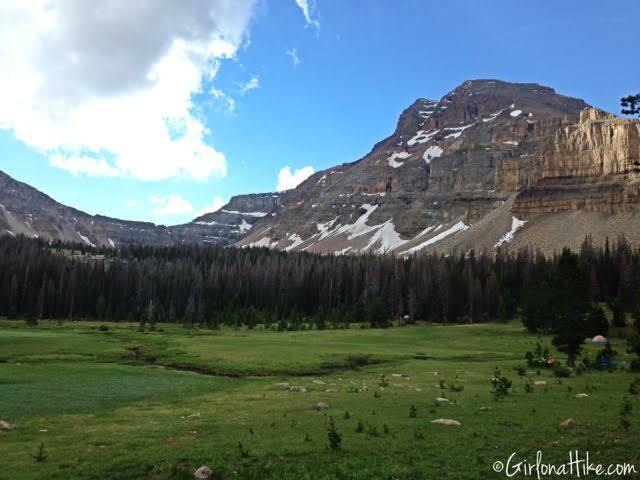 Keep in mind that the Uintas can get cold at night, and they also get the daily afternoon thunderstorm. 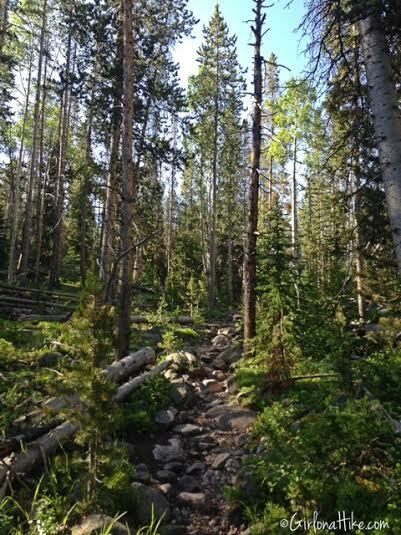 When backpacking to any part of the Uintas, be prepared for any kind of weather, and especially, mosquitoes. Amethyst Lake can be hiked to and from in a day, but to really relax and explore the area, plan on spending at least one night at the lake. Since I backpacked to Amethyst Lake over the July 4th holiday weekend, I spend two nights at the lake. 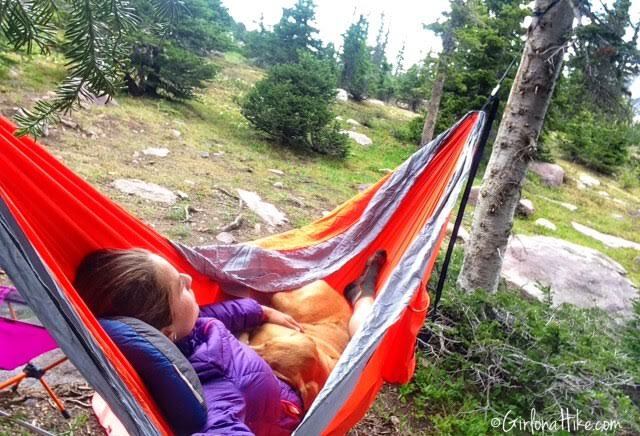 This solo trip was a way for me to relax, read, hang out in my new hammock, let Charlie roam the hills, and just rest. I've been needing some down time, and this was the place to let that happen. From SLC, head East on I-80 through Parley's Canyon. Once past Kimball Junction, UT take exit 146 for HWY 40. Drive another 3-4 miles and take exit 4 towards Kamas, UT. At the first light in Kamas, turn left. At the night light (at the Chevron), turn right. You will now be on the Mirror Lake Highway. 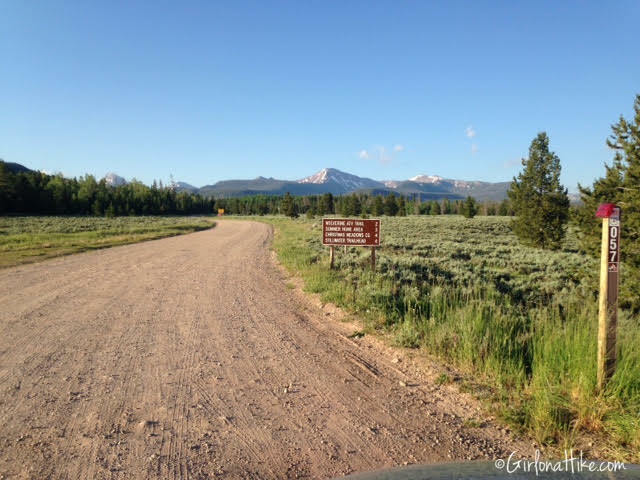 Drive 46 miles across the Mirror Lake Hwy, until you see the sign for Stillwater Campground. 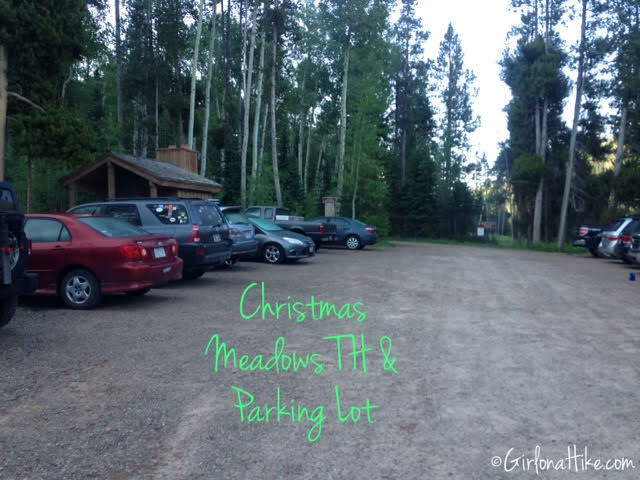 The turnoff for Christmas Meadows is not signed, but it's 0.2 miles past the Stillwater Campground sign, to the right. You'll immediately be on a dirt road signed UT 150 - drive another 4 miles to the very end of the road. This is where the parking lot and TH is. There is one vault restroom. Fees/Permits? The Mirror Lake Highway charges a $6 fee for a 3 day pass. It's free if you have an annual Mirror Lake Hwy or American Fork Canyon pass, or free if you have an annual National Park Pass. No permit is required. Driving up and over Mirror Lake Highway, I usually see Mountain goats. They are typically out feeding in the early morning or evening. I was happy to see a baby goat in the bunch! 0.2 miles past the Stillwater Campground, there's a dirt road off to the right. You'll turn here, and see the sign for Christmas Meadows which is 4 miles at the end of this road. The road is in decent shape - even my little Sonata was able to make it (slowly). The official Christmas Meadows sign! When I arrived on Saturday at 8am, the parking lot was full and I had to park in the overflow area. Make sure you hang your pass in your windshield - rangers will ticket you if you don't have one visible. 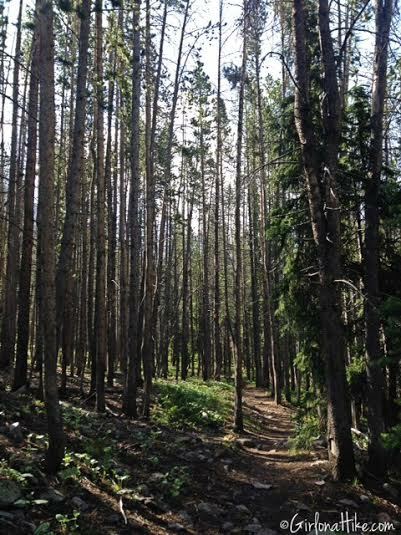 The trail is very well shaded with tall pine tress for beginning portion of the hike. The Christmas Meadows trail has a lot of water. What I mean by that is not only is there plenty of water to drink from (after filtering), but the trails are also water logged, can be mud pits, or very soggy soil. 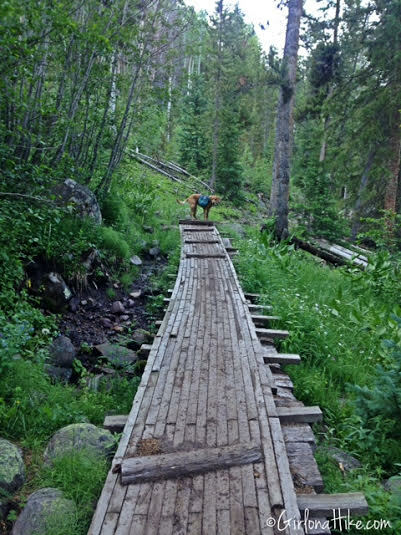 Most of these "bridges" were constructed by the Forest Service 20+ years ago. They definitely need to be updated, but my guess is that won't happen for awhile (if ever). Crossing more bridges. Some of them are not balanced, so watch your footing. 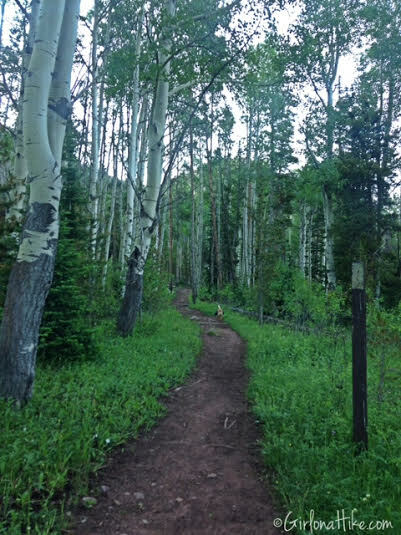 The trail takes you over rocky, rolling hills for the first 2 miles. 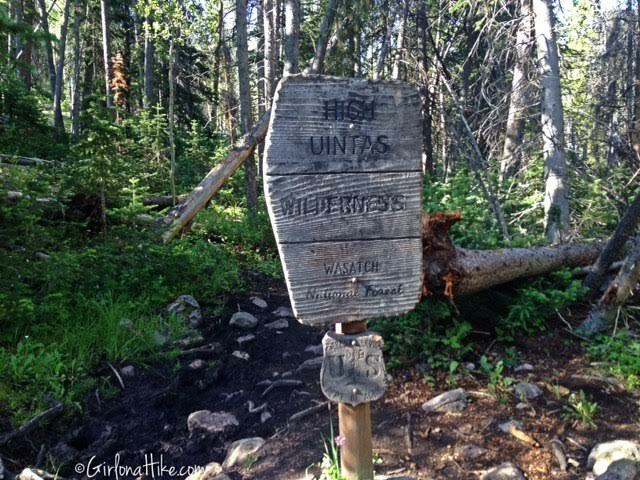 Official High Uintas Wilderness sign! 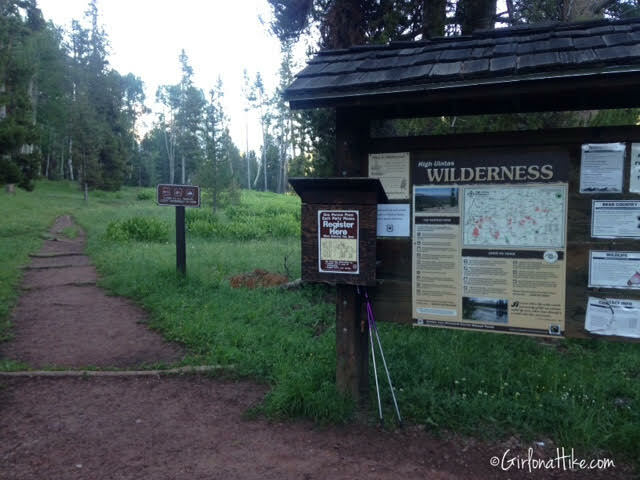 The trail split for Amethyst Lake is about 100 yards beyond this sign, to the left. At the trail junction. It's hard to see the sign, because its about 10 ft up the tree, in the shade. My white arrow on the left points it out. Keep an eye out for this large rock pile, so you know where to turn. 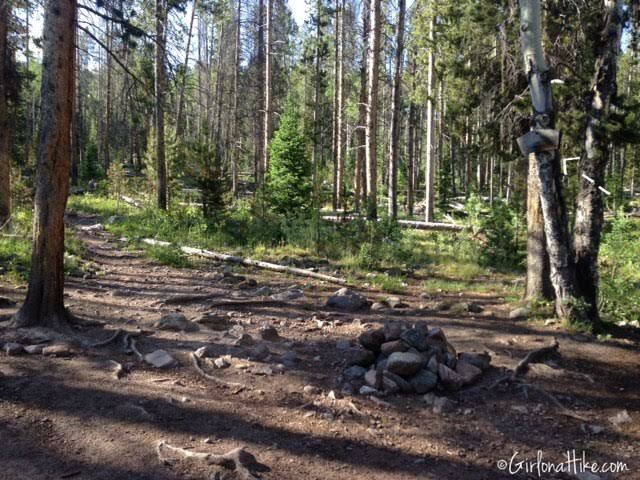 There is also a campsite off to the right of the trail. 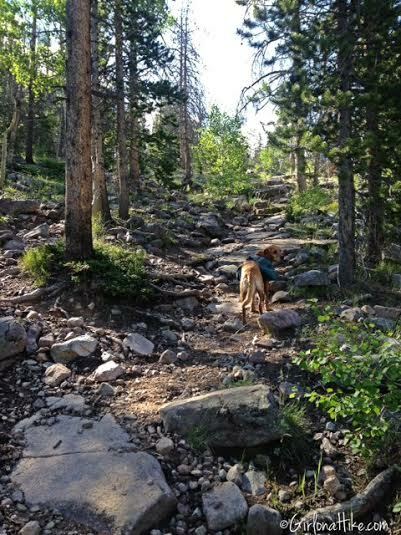 Once you turn off for Amethyst Lake, the trail becomes very steep and rocky. 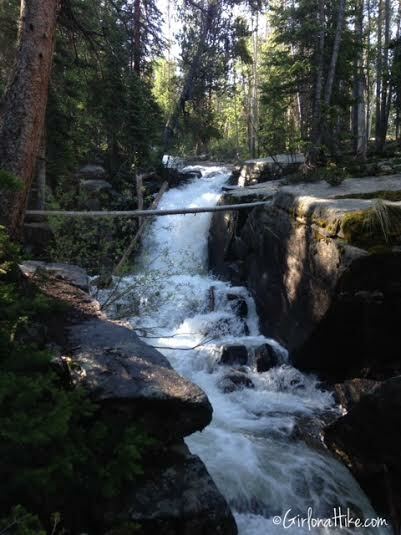 You'll hear the rushing of the creek nearby, and come upon what I am calling Amethyst Falls. Near the end of summer, this may be a very small stream compared to now. 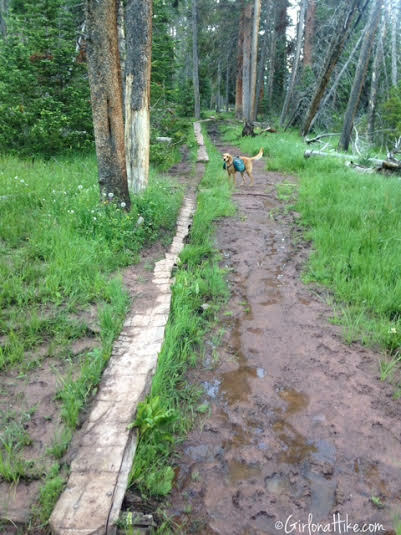 The trail doesn't show how steep the trail is here - take your time working your way up the Uinta slickrock. Finally the trail evens out - but only for 1/4 mile. You'll come to this first small meadow. Up until now, you won't get a very good view of where you are headed. Hike through more trees - it seems like this trail just keeps going up and up. I had to take several breather breaks. The 2nd meadow you come to is the big meadow, where you'll see a lot of campers. At this point, you'll finally have a view of Ostler Peak. 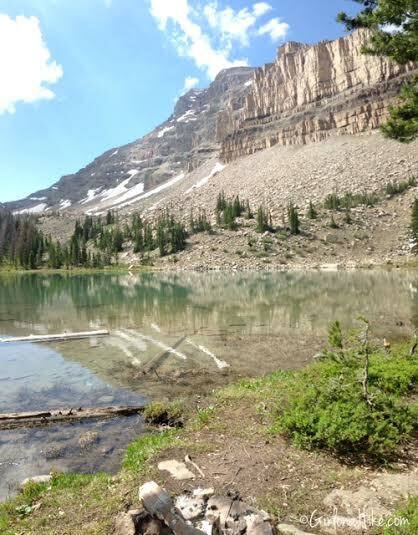 At the back of that basin, is where Amethyst Lake sits. Only another mile! 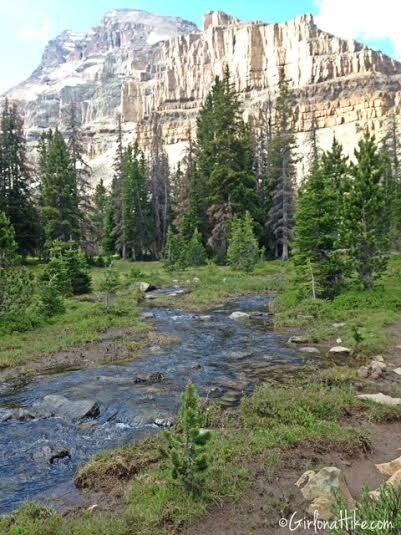 Hiking along the stream below Ostler Peak. Passing by an unnamed pond, that also happened to be a very turquoise colored lake, with several campsites around it. Passing by the 3rd open meadow. We're getting so close to the lake! I could finally see the green lake ahead. It took me 3:15 to arrive to Amethyst Lake. I quickly set up camp, because I knew the afternoon thunderstorms would be rolling in soon. Setting up my new Kroex Sports Hammock! I can't get over this view! After taking a nap, I walked up to the Western side of the lake to get a good overview of the area. The ridgeline across the way was so awesome looking! It also showed me just how big Amethyst Lake it. Charlie takes in his view - black & white style! Setting up my hammock to snuggle with Charlie and read. 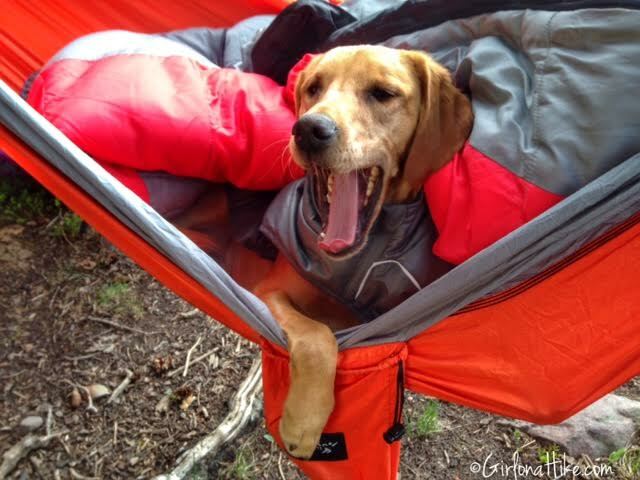 Yet 1 minute later he is yawning from the comforts of his spot in the hammock. On day 2 we decided to hike around the whole lake, and climbed up to some of those snow fields. I found a nice waterfall from snow to filter more water in. Nothing better than ice cold snow water! Taking in my view from where I was able to filter water. This was taken on the south end of the lake. Beginning to hike around the lake. If you are brave enough, there are some cliffs to the left that would make for awesome cliff jumping into the lake. I couldn't do it - the water was icy cold. On the East side of the lake, looking up to Ostler Peak. Climbing to that summit was one of my goals, but realized that since I was alone, it would be too tough of a climb by myself. I scratched that idea, and decided to just relax and hang out. On the northern end of Amethyst Lake, I found this small pond, with a great view of LaMotte Peak. Taking a nap before heading out for the weekend. Trail map looking North. Even though Google Earth shows snow, there was no snow on the trail itself, only in the basin area. 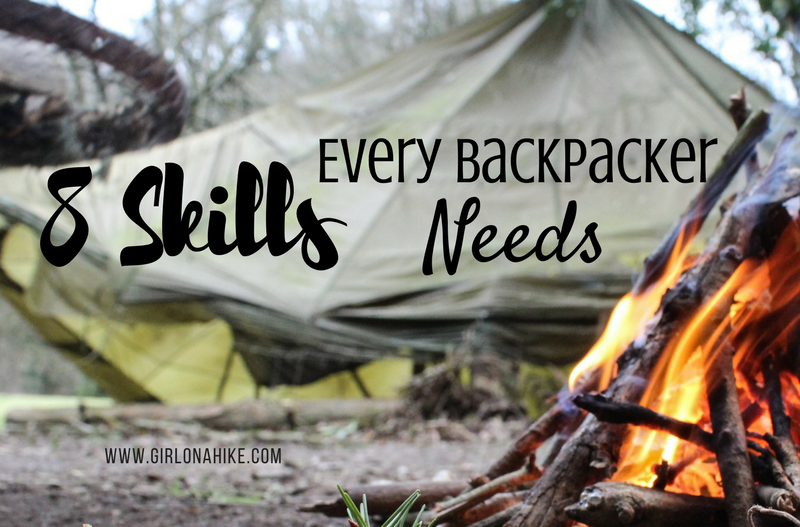 Check out these 8 Skills Every Backpacker Needs! Nice trip report. Makes me want to go back! so insanely gorgeous! 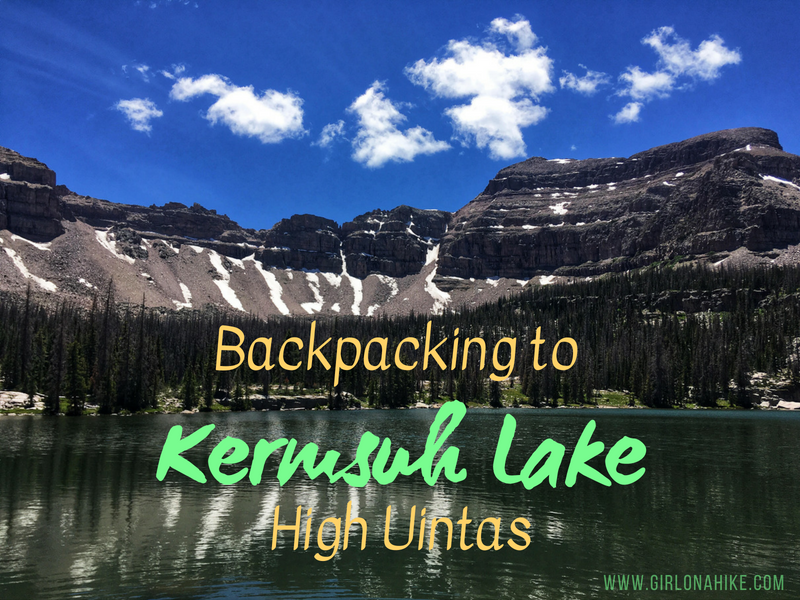 I camped at Stillwater last fourth of July and looked into hiking around there, werent many day trip options but now I am regretting not hiking out to this beautiful lake! 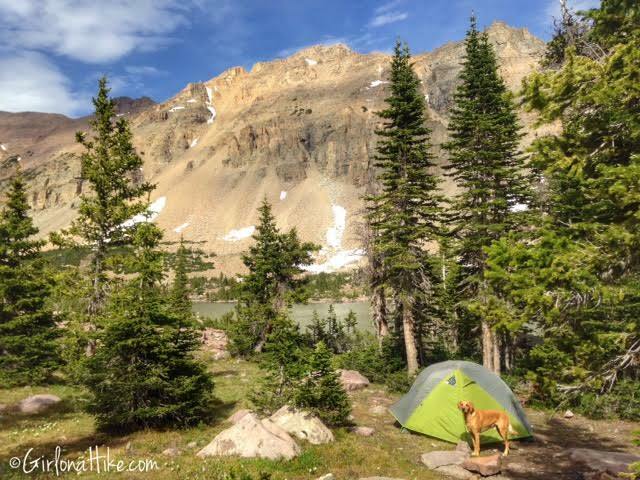 How do you find places you can camp overnight? I am bad at finding them. Also did you sleep in your hammock over night or have a tent also? Awesome write-up. Is a bear canister needed? How cold did temps get at night? 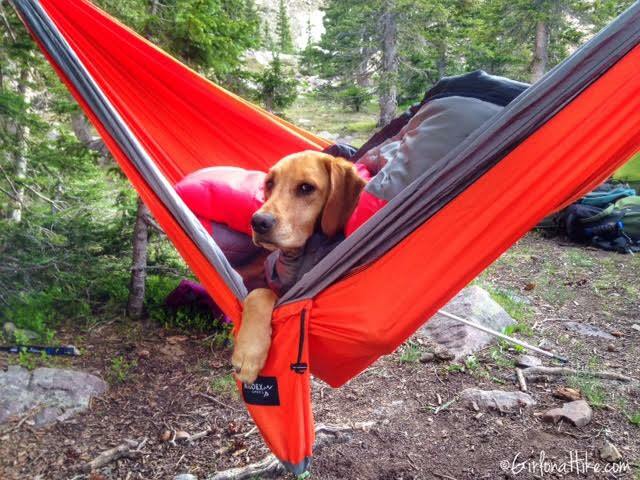 What a nice weekend for you and Charlie away from the crowds:) Charlie was so cute in the hammock:) Spectacular spot. Love the lake shot where you mentioned jumping off the cliffs. 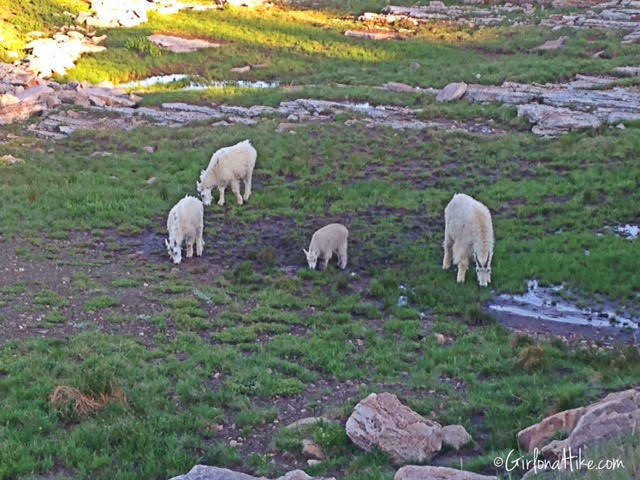 I spent several summers as a teenager (1954--1958) with my uncle who grazed his sheep in these high mountain areas as part of a government grazing permit. Your pictures and descriptions brought back lots of memories. There are really three main areas as you go south from Christmas Meadows. Each one has its own challenges and beauty. There is one or more lakes at the head of each of these canyons. My uncle, helped the fish and game department haul fish in cans attached to pack saddles to those lakes--then the fish and game department started to fly planes and dump fish. I enjoyed your descriptions. Try the trails to Ryder Lake and (I forget the one to the west). I have skillions of memories and I believe I could still retrace lots of places, etc. Alicia, I really enjoy your writing. Last year I did Coyote Gulch and also went in at Hamblin Arch. It was a fabulous trip. Your pics took me back. 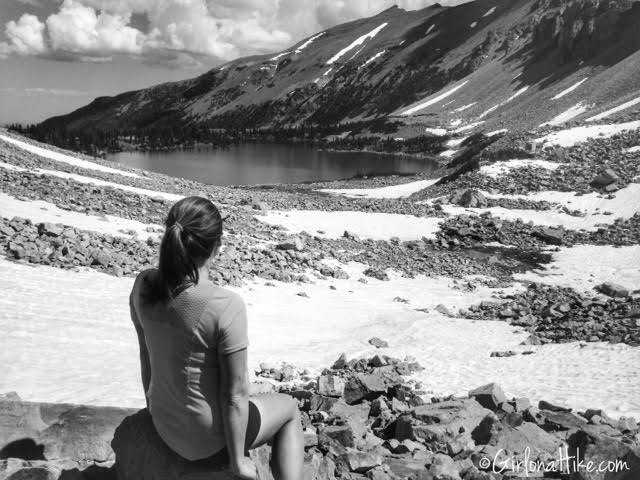 June, 2016 I did a trip into Chicago Basin near Silverton, CO and in June, 2017 will do Huron Peak with my Border Collie, Maggie, after which I'd like to backpack 3-4 days in Utah with her. The Uintas look like a perfect option for us. I'm thinking of a day hike in, camping for 1-2 nights and a day hike out. I'd also enjoy a bit of fishing! 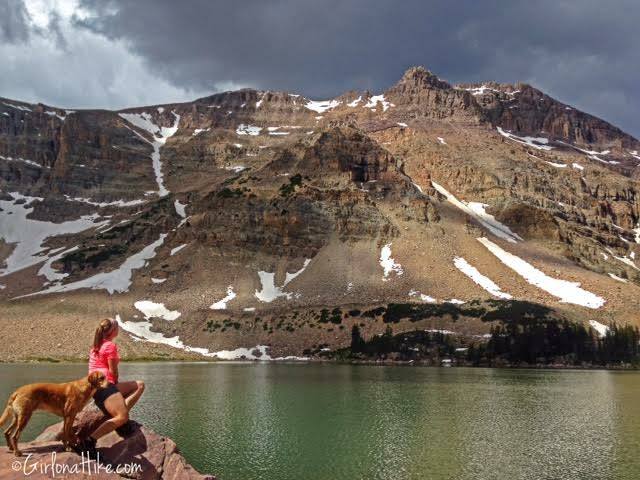 You have lots of experience in the Uintas. What would you recommend? 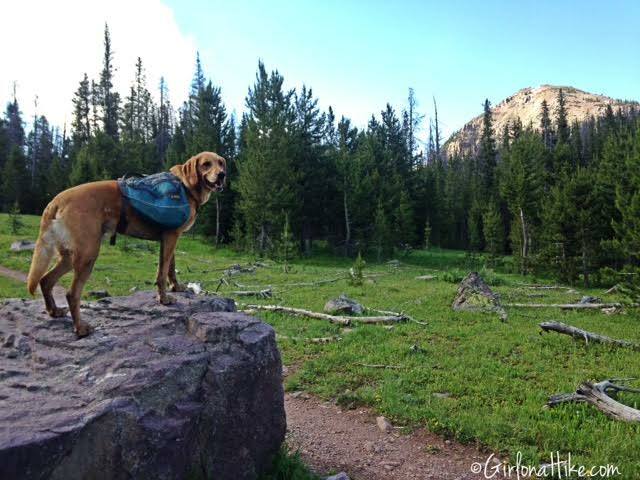 Is the trail up Kings Peak dog friendly? After Huron I may not want the Kings Peak hike, but would consider it. If it's took taxing, I may opt for a relaxing couple of days in the hammock or with the fishing pole. I usually go late June, what can I expect during that time of the summer? Thanks again. Love your reports. Quick follow up...so are you saying tht King's Peak and Amythest Lake are not open either until July 1st? That's correct. They closed all the winter gates yesterday (Nov 1) in Utah. 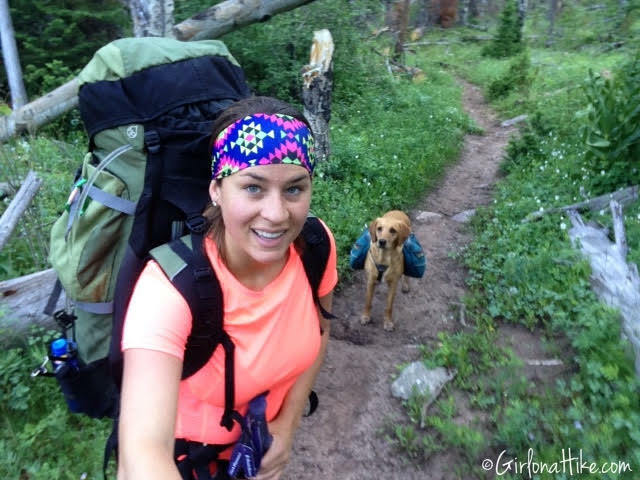 Hi Alicia, I purchased a great book called "best hikes with dogs-Utah" by Dayna Stern. 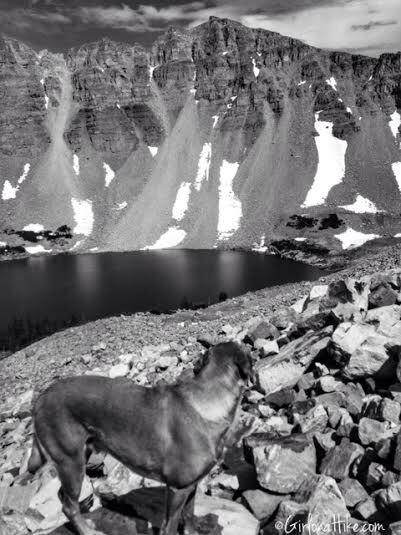 I'm still interested in the Uintas in late June/early July if possible. 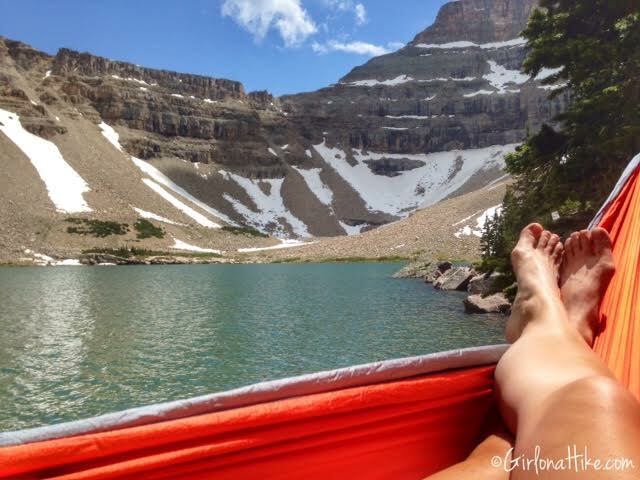 One trip highlighted in the book was the Henrys Fork to Dollar Lake Loop. Stern says its 17.5 miles and takes 1-3 days. Based on our earlier dialogue I'm not sure if this trail is accessible at this time. Any idea? Could I get my truck to the trail head? And, would there still be snow on the ground and the lakes frozen? I would be bringing Maggie, my 5 year old Border Collie. Thanks again for your advice. I'm preparing for my western trip next month. 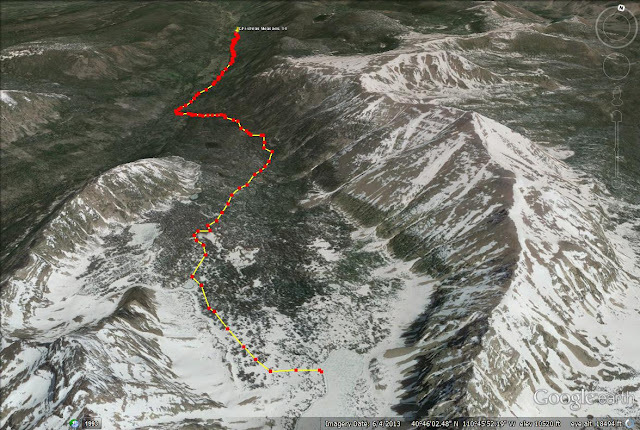 I'm bringing my border collie Maggie and am planing on backpacking into horn fork basin and climbing Mt. Harvard. However if snow is still too prevelant, I'm planning a "Plan B" and Amethyst Lake is on my radar for the last week of June. How's the snow load this spring? The melt? Do you think this would be accessible the last week for June? Any other trips that would be good for me and Maggie that would be a good pack and allow for some tranquil fishing? Thanks. Thanks, Alicia. I'll look into those. I appreciate your blog. I'm not a blog person, yours is literally the only blog I follow. Thanks again. Wow, the best of compliments - thank you! Alicia, I've decided too stick with Horn fork basin in Colorado, then return to Escalante to do two days of slot canyons. I've researched Spooky and Peekaboo, they're doable with my Border Maggie. Any others you'd suggest? Thanks again for being such a reliable resource. Sounds perfect! When you hike the slots, I suggest hiking up Spooky first, then make a loop coming down PeekaBoo. It's easier to get down the 10 ft drop rather than climbing up it. Your dog will have an easier time as well. Also check out Zebra Slot Canyon (every time I've gone there's been water so no blog post on it), Neon Canyon/Golden Cathedral, Reflection Canyon, and of course, Coyote Gulch! So many options! 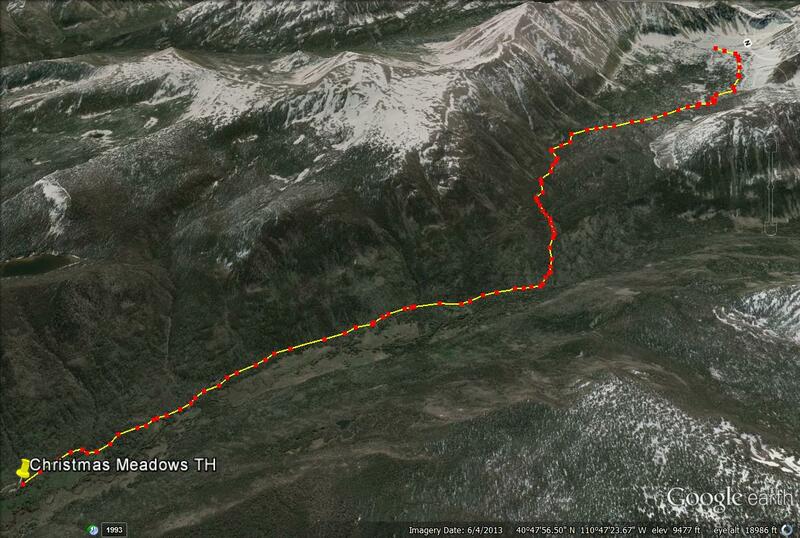 I'll be down there this weekend backpacking Little Death Hollow. 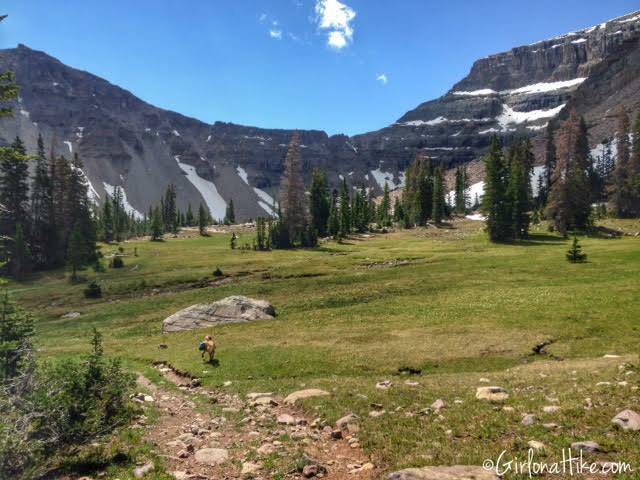 I live on the south side of the Uintas and have only done a couple backpacking trips in them. I'm usually heading out for more well known places in Wyoming, Colorado, our southern Utah. This trip report makes me feel guilty for not showing more attention to my home range. I will definitely have to hit Amethyst this summer! 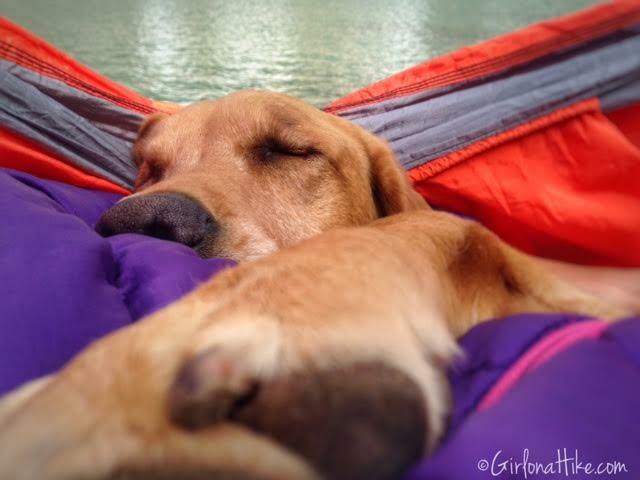 My boyfriend, dog, and I are doing a one nighter to Amethyst Lake Friday! 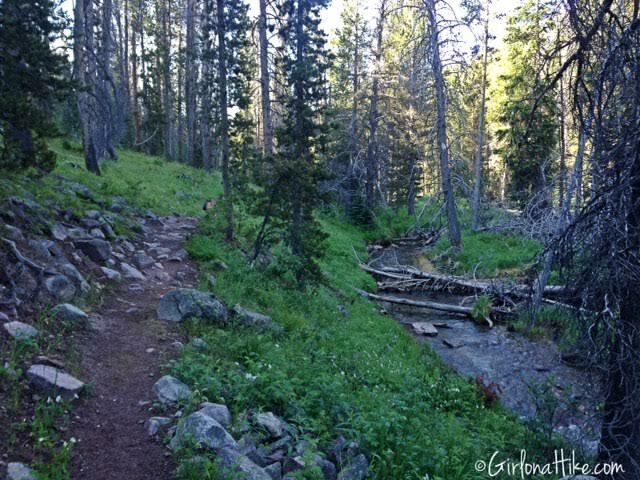 Do you know if there is a trail that on the way back you could take to Scow Lake and then back over to the trail head parking lot? My grandpa's name was Scow it's a very Scandinavian/Swedish name. I would love to be able to see it! Thanks! How to Camp for FREE In Utah!